A while ago I posted on a now defunct web-site called My Deco about Hollywood mirrors and their unashamed glamorous appeal. A supplier I knew was selling some and I got a flood of emails saying Me Me Me – lots of wanna-be and indeed should-be super-starlets out there! The supply dried up but the emails continued. I found myself researching mirrored lights again yesterday, finding both a high tech LED version and a super cool magazine featured one, inspiring me to update this post. As Wallpaper comments in this rather tongue in cheek article, even poodles are partial to a fabulous Hollywood mirror and why wouldn’t they be, eh? The original dream Hollywood mirror I found (pictured below) is called Perito Moreno, after a South American glacier no less. I think it’s quite marvellous, however so it should be at $3,600, ouch! Now that’s the sort of mirror a *real* Broadway leading lady might have…. and it’s available from Iris Designs Studio, so start saving up my lovelies. 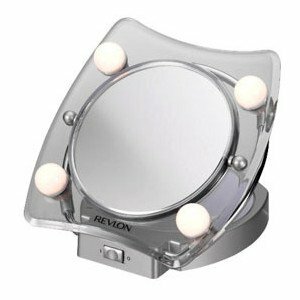 Back down to earth with a bump and Revlon have one, below, at £50 or better if on sale as it often is on-line, but the reviews on it ain’t great. t’s 600mm in diameter, LED lit, with a demister pad and an infra red on/off switch, all mod cons eh. Two views of it below, but I can’t drag the best one off their web-site (silly billys), zip onto their link to see it – under Mirrors – Clarity – then scroll along to the Opus mirror. It’s not the easiest of web-sites to navigate but the product is good. You’ll need to find a local supplier on-line. It’s designed for a bathroom but that doesn’t mean it has to be! Rrp £252 but you can find on-line for less. Or alternatively, you could make your own with two of these Musik strip light from Ikea positioned on the wall either side of your chosen mirror. I’ve got one over a mirror in my house and they are very bright! Wow, I love these! Great article and I might just have to look into making our own version. Great way to brighten up a dressing table.